Jessica Simpson Womens Cirrus Dress Pump- Select SZ/Color. Color: Taupe. They fit like size 6.5M. They are gently worn. Heel Height: 3.5". Length : 9". 3" patent leather wrapped heel. Patent Leather upper. Almond shaped toe. Heel Type: Kitten, Stacked. Materials: Denim, Leather and man made. Heel Height: 3in. Color: Blue Brown and Silver. Features: Studded, Leather Lining. Pattern: Solid. 3.25" width. Slightly worn upper(scuffs), inner, insole, heel(scuffs), and sole. • Pointy toe design. • Super soft kid suede leather upper. A fashion must have! This pump is a fun and sassy pump that looks great at work or out on the town. 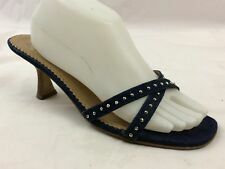 • Low 2.25" stacked heel. • Made in Brazil. Soft texture gently relaxes this posed two-piece. Single sole. 100% Micro Suede Fabric. Learn More. Size: 9 M US. Soft texture gently relaxes this posed two-piece. (Continental US). 100% Lizard Print Synthetic. Learn More. Give us the chance to find an agreeable solution for you! (Rare but possible). Products may be sold out, or on back order. 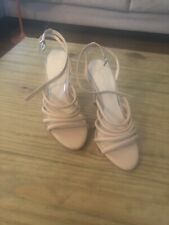 Jessica Simpson Womens Cirrus Pump- Pick SZ/Color. Soft texture gently relaxes this posed two-piece. Single sole. 100% Micro Suede Fabric. Learn More. Size: 7 M US. Soft texture gently relaxes this posed two-piece. Single sole. 100% Micro Suede Fabric. Learn More. Size: 8 M US. Soft texture gently relaxes this posed two-piece. Single sole. (Continental US). 100% Micro Suede Fabric. Give us the chance to find an agreeable solution for you! (Rare but possible). Products may be sold out, or on back order.